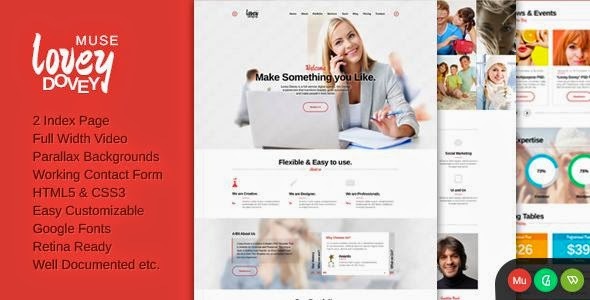 LoveyDovey is a light and clean and retina ready Adobe MUSE template. Developed and decoded with the Muse CC 2014, It is great, professional and easy to use template. the template has been designed to help you create an outstanding, elegant and professional look Photo Studio, Freelancers, Portfolio Theme, Creative Agency etc. Item Reviewed: Lovey Dovey One Page Parallax Muse Template 2015 9 out of 10 based on 10 ratings. 9 user reviews.